a complete educational single CubeSat project with the goal of enthusing and educating young people about radio, space, physics and electronics. the “ground segment”, or a radio receiver designed to allow anyone to try their hand at reception of satellites like FUNcube anywhere on Earth as part of a global educational collaboration project collecting information from space. 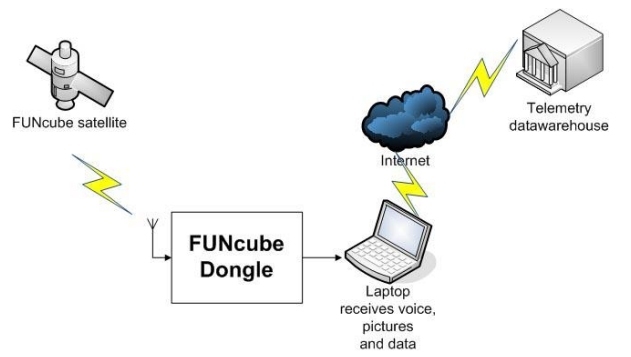 As shown in the above diagram, the telemetry data obtain can be shared at the FUNcube Real Time Data on line warehouse. Find more about FUNcube and other space radio projects in the HobbySpace Radio section.